Today I want to show you the card that I made for the current challenge at Copic Spain. Our theme this month is "Fairies" and our sponsor, Emerald Faeries, was the perfect match. Now, this card was a scrap-lift form a card I saw a few weeks ago. I had been thinking for some time about making a card where the stamp was not the focal point and this card game me the idea. Thank you for sharing your talent! In this card: White, black and yellow card. Recycled patterned paper from a perfume bottle. A fun coloured image! Thank you for sharing at Stamping Sensations! Fun image and a great card! Thanks for sharing with us at Stamping Sensations! Love your coloring, as well as all the embellishment details - the doily, flowers, swirly gems, the cloud background . . . this came out really nice. 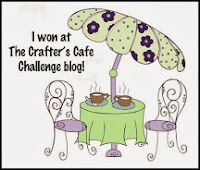 Thank you for entering your creation on the Love To Scrap challenge blog. Such a fabulous creation! Thanks for playing along with us at The Corrosive Challenge Blog! Hugs! nice work, thanks for joining #260 challenge with Craft Your Passion. Hope to see you again this week! This is soooo pretty! Totally adore the great background you have created for this fun image! This card is pure fun and happiness, and I'm sure it can bring plenty of joy to whomever receives it. Jättegulligt kort!! Tack för du är med i vår utmaning på CMS! Lycka till!